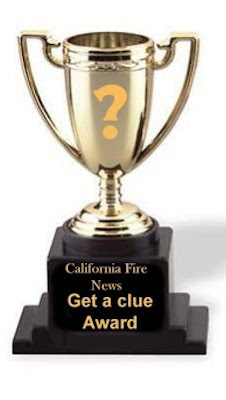 Apparently using a 2.5 pound fire extinguisher from a distance on this ripping, working apartment fire yesterday in Concord, A Concord Police departments officer is credited with the departments "Futility" award in conjunction with the First annual California Fire News "Get a clue" trophy. 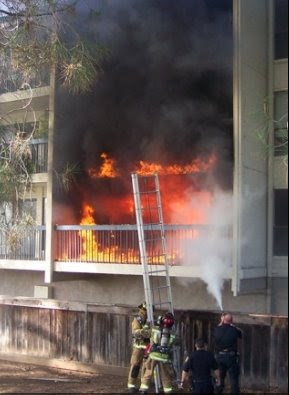 Firefighters had to yell " Get out of the way"
Apologies to the CoCo Sheriff which was originally credited with this brain fart! Guess they figured that they stood in the wrong application line to get the job, but looking at this I'm glad they are not on a rig. I believe they are Concord PD, not CoCoSO. The video on this is hilarious, towards the end the firefighters yell at the cops "GET OUT OF THE WAY!"